If you want to be a school building leader in New York, you’ll need to take the NYSTCE School Building Leader (107/108) Test, a certification exam that helps determine whether you’re ready to take on this important responsibility. This guide tells you about the exam and study tools that can help you prepare. 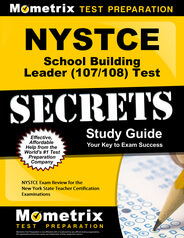 What’s on the NYSTCE School Building Leader (107/108) test? NYSTCE NYSTCE School Building Leader Exam Study Guide and Practice Questions. Print or eBook. Guaranteed to raise your score. Get started today! The building leader test has two parts. Part One has 41 selected-response items and three performance tasks. Candidates have four hours to complete this portion of the exam. The performance tasks account for 60% of the score, while the selected-response items account for other 40%. Part one has two categories: Instructional Leadership for Student Success – the category that holds the greatest emphasis – and School Culture and Learning Environment to Promote Excellence and Equity. Candidates will be asked to analyze data, such as student performance data, to assess and build on strengths in the school’s instructional program. Candidates will also be asked to identify areas of need and build strategies to meet those needs. NYSTCE School Building Leader Flashcards. 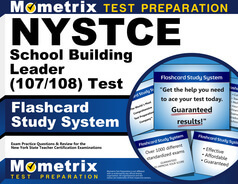 Proven NYSTCE School Building Leader test flashcards raise your score on the NYSTCE Multiple Subjects test. Guaranteed. Part Two has 26 questions and three performance tasks. The test time for this portion of the exam is also four hours. The performance tasks account for 75% of the score, while the selected-response items account for 25%. Part Two has three categories — Developing Human Capital to Improve Teacher and Staff Effectiveness and Student Achievement, Family and Community Engagement and Operational Systems, Data Systems, and Legal Guidelines to Support Achievement of School Goals. For the first performance tasks, candidates will view a video of a teacher’s classroom performance and then analyze and evaluate it based on a state-approved rubric. In the second performance tasks, candidates will analyze teacher evaluation and other data involving human capital development. In the third task, candidates must analyze a scenario and explain strategies for addressing issues related to the scenario. Selected response items include a reading followed by several questions the candidate must answer. Candidates who elect to take both portions of the exam on the same day have 8 hours and 40 minutes to complete the exam. The test time includes 40 minutes for lunch. The test is available during six testing windows through the year. Test scores are available roughly three to six weeks after candidates take the test. Part One costs $214, and Part Two costs $213. The fee to take both parts is $427. Candidates have one year from the registration date to take the exam. You can reschedule your appointment with no additional fee provided you do so 24 hours prior to your test date. Candidates who withdraw their registration or cancel their test appointment are eligible for a partial refund of their testing fee. What’s the passing score? What’s the retest policy? The passing score is 520. Candidates who do not pass the test must wait 30 days before retaking the exam. Candidates can retake the test as often as they need provided they pay the registration fee each time. What are the test center policies? Candidates must bring a valid form of government-issued ID to the test center. This identification must contain a photo and signature. The name on the ID must match the name on your testing documents. Acceptable forms of ID include a passport, driver’s license and military ID. Candidates are not allowed to bring any personal items into the testing room. Personal items include electronic devices like mobile phones as well as watches, purses, hats, coats, bags, calculators and more. Candidates must leave all personal items in a secure area at the test center or leave them to their vehicle. Candidates are not allowed to have any visitors, including children and spouses, in the test center. When in the testing room, candidates will receive a noteboard booklet and wet-erase marker they can use during the test. Those items cannot be removed from the testing room. A test administrator will log candidates into the exam. Make sure to arrive early on the day of your test. Candidates who arrive more than 15 minutes late will not be able to take the test and will lose all fees. Absentees will also lose all fees. To prepare for this test, you should have a well-written and researched set of study materials, and Mometrix has those for you. Our study guide contains all the information you need to prepare for the exam and will detail ways to navigate the most challenging questions. Our flashcards provide the answers to questions right on the back of the card, making it simple to study for the exam anywhere and at any time. Combined, these are two excellent tools to help you pass the test.